The forecast for Hurricane Florence on Wednesday morning at 10 a.m. EDT, for the next five days, by the National Hurricane Center. Schools along the Eastern Seaboard are bracing for widespread damage from Hurricane Florence. This morning, Sept. 12, the National Weather Service said, “Major Hurricane Florence continues to bear down on the Carolinas and mid-Atlantic. High surf is already impacting portions of the east coast. Heavy rain and strong winds from Olivia could produce landslides and flash flooding in areas of Hawaii that are usually drier. A Gulf system is expected to produce heavy rain in Texas. Issac is being monitored for potential threats to U.S. territories. The National Hurricane Center said on Monday that Hurricane Florence had become a Category 4 hurricane, and on Tuesday it continued to feature maximum sustained winds of 130 mph. By Tuesday afternoon, NHC said Florence is “getting better organized and increasing in size,” with a “life-threatening storm surge possible along the coasts of North and South Carolina.” Perhaps worst of all, inland flooding is predicted to follow. In South Carolina, the governor ordered that schools and state offices in some counties to be open on Wednesday: Aiken, Allendale, Bamberg, Beaufort, Barnwell, Colleton, Hampton and Jasper. 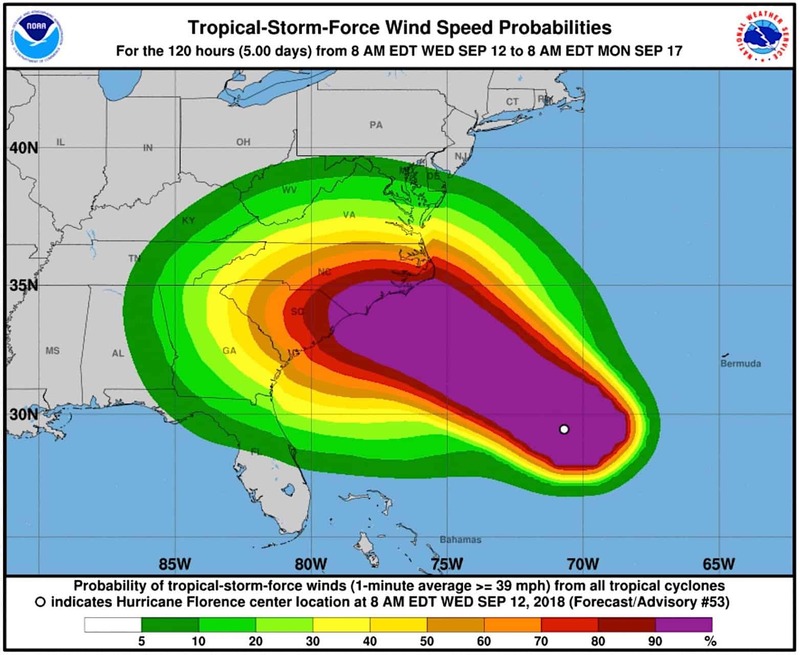 Governor Henry McMaster ordered the evacuation of coastal South Carolina residents in all hurricane evacuation zones at the beginning of this week. Along the coast, though, all eight counties were given a mandatory evacuation order: Jasper, Beaufort, Colleton, Charleston, Dorchester, Georgetown, Horry and Berkeley. In Georgia, there have been no school closings announced yet. No closures have been announced in Florida. In Virginia, Halifax County Schools announced closures for Thursday and Friday; also, Gloucester County Schools are closed until further notice. In Maryland, there had been no school closures announced as of Tuesday, and none in Delaware.